The impact of sarcopenia on digestive cancer is widely known. Muscle mass, defined as the psoas muscle index (PMI), is an important parameter of sarcopenia. However, the relationship between esophageal cancer and PMI has not been fully investigated, especially in patients receiving neoadjuvant therapy. 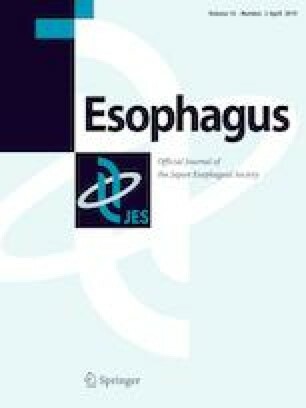 To elucidate the influence of the PMI on patients with esophageal squamous cell carcinoma receiving neoadjuvant therapy, the progression of sarcopenia defined by the PMI, the relationship between pretherapeutic/preoperative sarcopenia and patient characteristics, and patient survival were retrospectively investigated in 82 patients with esophageal squamous cell carcinoma who underwent neoadjuvant therapy. The PMI decreased by more than 20 mm2/m2 between the pretherapeutic and preoperative periods in 75.6% of the patients. Pretherapeutic sarcopenia (low PMI) correlated with the pathological therapeutic response, postoperative recurrence, and pretherapeutic body mass index. Neoadjuvant chemoradiotherapy was associated with the progression of sarcopenia. The pretherapeutic sarcopenia group (low PMI) had worse disease-free survival (DFS) than the non-sarcopenia group. Furthermore, pretherapeutic sarcopenia (low PMI) was an independent prognostic risk factor of DFS according to univariate and multivariate analyses. The PMI may decrease during neoadjuvant therapy, especially during neoadjuvant chemoradiotherapy. Pretherapeutic sarcopenic (low PMI) patients should be followed-up more carefully postoperatively because higher risks of recurrence and poorer rates of disease-free survival are associated with these patients. We would like to thank Editage (http://www.editage.jp) for reviewing the English language of this manuscript. The study protocol was approved by the Ethics Committee of the Tohoku University School of Medicine (Accession No. 2018-1-223), and informed consent for the use of clinical information for medical research in the future was obtained from all patients prior to surgery. Our works conforms to the guidelines set forth in the Helsinki Declaration of 1964 and later versions. There are no financial or other relationships that could lead to a conflict of interest.